Finding the best RV solar panels, kits and installing one in your vehicle is the key to ensuring that you can extend and enjoy your trip as long as possible. Note that one great thing about owning a recreational vehicle is that it provides you with the freedom to hit the road and travel without the need to stop. You will notice that anywhere you go can be considered as your home. Your traveling experience will also be limitless. It allows you to enjoy the kind of adventure and travel that you are dreaming of. If you are an RV owner, then take note that solar power complements your lifestyle and travel needs perfectly. It is because it is one of the most eco-friendly, quietest and cleanest power source. Outfitting your vehicle with a solar panel makes it possible for you to enjoy the benefits of this free source of power. In fact, a good and reliable RV solar power installation gives you the opportunity of charging your batteries independently. In addition, it is beneficial because aside from having a long lifespan, it also requires the least maintenance. 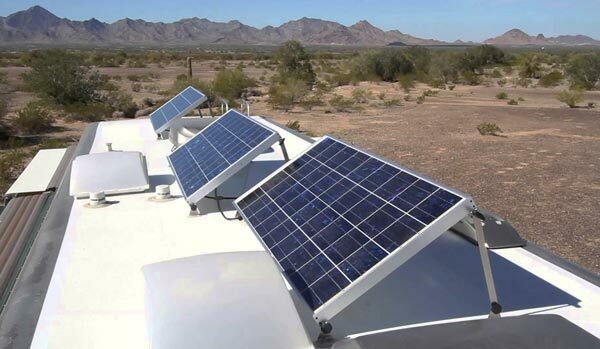 The components of RV solar systems are also readily and easily available and accessible. You will get the chance to enjoy a free power source without the pollution, odor, and noise. If you are seriously considering buying RV solar panel kits then the reviews of this 10 products might be of great help to you, especially in formulating a good buying decision. If what you are in search of is a highly reliable solar 12-volt battery charger, then this 100-watt mono-crystalline solar starter kit from Renogy should be one of your choices. I usually see this product being incorporated in a good Renogy flexible solar panel review considering its effectiveness and high satisfaction rating. This is an excellent choice, especially if you aim to choose the right RV solar panels. It is mainly because of its ability to supply a generous 100-watt power. Such power is adequate enough in running a few devices simultaneously through its 12-volt battery charging. One benefit I enjoy about this choice is that it is capable of supplying additional charging, thanks to the fact that you can wire it into a series together with other solar panels. It is smartly and nicely designed, allowing it to withstand the snow, wind, and a lot of other harsh elements. Another impressive fact about this kit is that the solar panel is constructed out of strong and sturdy materials as well as high-conversion efficiency modules. I also noticed that the panels are constructed from high-transparency and anti-reflective glass while also boasting of their improved stiffness. With its high resistance to impact, it is no longer surprising to see it being referred to as one of the strongest solar panels today. One problem I noticed, though, is that this solar panel is heavier in comparison to other flexible solar panels. 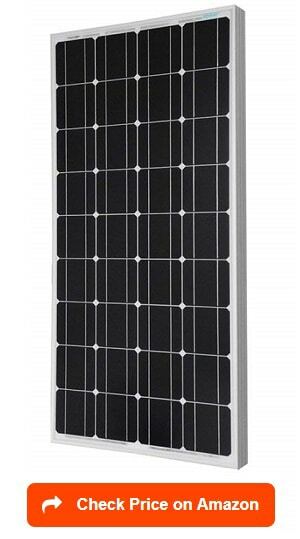 Another highly reliable solar panel for RV battery charging that you can use is the WindyNation 100-watt solar panel. I noticed that this excellent starter solar panel kit is offered at an affordable price while supplying you with the things needed to harness the clean and free energy provided by the sun. I also realized that it works as a highly efficient and reliable solution for backup power or off-grid situations. 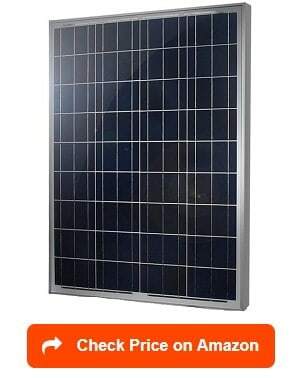 Falling under the polycrystalline solar panel category, expect this product to deliver a power of up to 100 watts. I am pleased to say that it already comes equipped with a P20L charge controller, which is known for its quality and versatility. With this controller, you can easily keep track of amperage, load draw, voltage, amp-hours, and temperature when charging. The solar panel also takes pride in its easy to use user settings. With such feature, fine-tuning the charging and raising the efficiency using customized values will be much easier. It is a good choice if you are still a beginner in using solar energy within your vehicle. It also improves your flexibility while giving you the opportunity to expand the installation of additional panels in the future. It is also versatile since it is useful not only in recreational vehicles but also in homes, for remote and backup power, and in cabins and boats. One possible drawback, though, is that the quality of the panel is lesser in comparison to other high-priced ones. 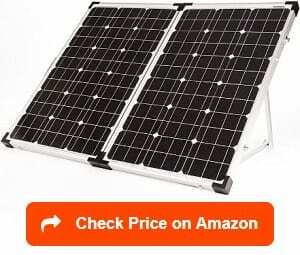 Some of the most reliable portable solar panels for RV reviews also recommend this third product I will recommend, the HQST 12-volt 100-watt polycrystalline solar panel. 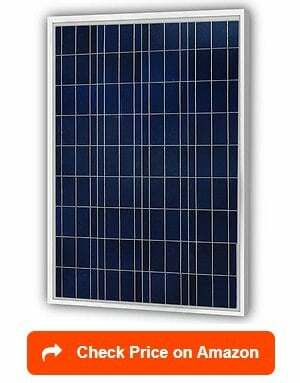 I find it highly dependable as the panel has 36 highly efficient polycrystalline solar cells while also having a tempered glass as protection. 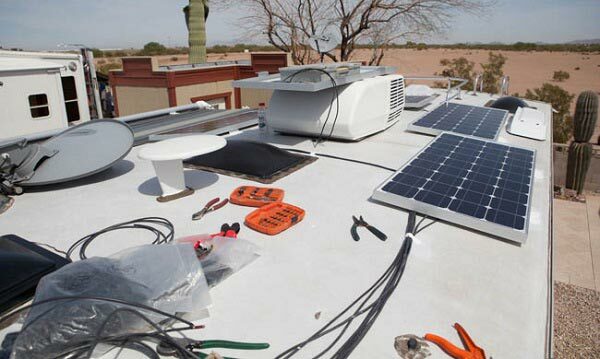 It is a good component if you are planning to create an off-grid solar power system. The solar panel is also constructed in such a way that it can resist wind loads and heavy snow. The back of it has a waterproof junction box, which means that it can also handle the harsh and heavy rains. With the MC4 leads integrated into the panel, you will also find it easy to plug and use. It is also one of the easiest to install solar panels. 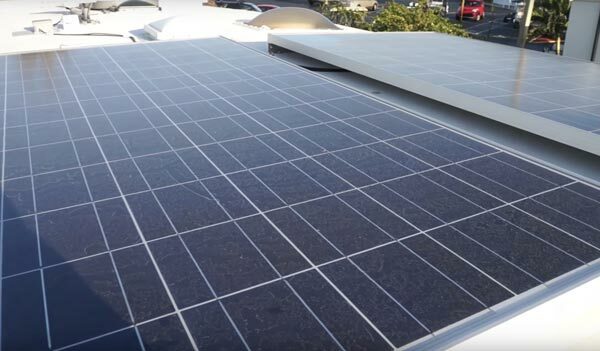 Whether you are planning to install it using the ground-mounted or the off-grid rooftop approach, I can still assure you of the ease of the whole installation process. It even has pre-drilled holes that you can find at the back that further promote ease and rapidness when it comes to mounting and securing it. I like the versatility of the solar panel, too, as it works for both rural and residential purposes. You will also notice its compatibility not only in RVs but also in boats, caravans, motorhomes, and trailers. Furthermore, it makes use of a frame constructed from a corrosion-resistant aluminum material, allowing it to last long despite being used for a long time outdoors. This solar panel is a bit heavy, though, which is one of the most common complaints of some of its users. Another of the most portable solar power units that you can choose from is the Renogy 12-volt 200-watt Mono-crystalline solar starter kit. It is specifically designed for beginners to a solar panel. I find it effective for off-grid applications. This means that it works well for recreational vehicles, cabins, sheds, boats, and trailers. One remarkable benefit I wish to highlight in this starter kit is its ability to produce power in a quiet manner. It also promotes grid independence. It has most of the tools that you need to make a new solar system work, including the solar panels, themselves, the charge controller, adaptor kit, connectors, Z-brackets, and tray cable. The included 30A PWM charge controller in the kit can be expected to help in expanding your solar system to a max of 400 watts. It also has a negative grounding controller, which offers protection against battery reversal, short circuit, overcharging, and overloading. With that, I can safely say that it promotes a high level of safety and a broad off-grid application. It is also possible to use it on a vehicle with a battery negative found on its chassis. Installing this solar panel kit is also easy. In fact, you can complete the installation in just a short period of time. However, it is lacking in terms of installation instructions but considering the fact that it is easy to install, this is just a very minor drawback. You can also choose this next mono-crystalline solar RV and off-grid kit offered by Renogy. What I am so pleased with in this kit is that it is genuinely capable of recharging your RV’s batteries, making it possible for you to have fun watching the great outdoors – all that is possible without any additional noise. With the solar panels from this kit, you can operate your onboard electronics and equipment without the need for a power hookup. What is even better about this solar power kit is that it is designed in such a way that it can specifically meet the requirements of RV users. I find the charge controller of this Renogy solar power kit beneficial because it promotes the quick and safe charging of the battery regardless of the condition. It can also supply up to 200 watts of power, which means that you can really maximize its use. Such power allows you to make the most out of the system. I find its 18.4 percent solar cell efficiency very favorable, too, as it already gives users the specific level of efficiency they need. The controller is also known for being negative grounding. With that, expect it to be compatible with safe and broad off-grid applications. I am also quite sure of the ability of these solar panels to last for a long time. It can even withstand harsh elements including heavy snow and winds because of its aluminum frame, which is not only ideal for outdoor use but is also sturdy and corrosion-resistant, thereby boosting its durability. However, some users also find this choice for portable solar power kits camping pricey and expensive. The ACOPOWER 100-watt foldable solar panel kit is also one great choice for your RV’s solar system. I noticed that it is a vital component of a system, especially for those who choose to go the off-grid solar system route. One positive thing I like in this solar panel kit is that its panels are compact. This means that you will not encounter any problems managing them and setting them up. I also find it useful in a wide range of applications. Whether you have plans to camp or enjoy a beach trip, the panel can help set up your preferred off-grid system. You can also use it for marine applications, dry camping, and any other off-grid purposes. It is also designed in such a way that it serves a generator-ready or a battery-ready kit. With the MC4 connectors provided by the kit, it is also possible for you to connect an additional solar panel with a maximum power supply of 40 watts. This promotes ease in charging the battery faster. I am also pleased with the easy setup process of this solar panel kit. It is portable, making it easy to manage while having its own pre-installed stands. With that in mind, there is no need for you to separate its mounting brackets. It also has its own protective suitcase, so bringing it anywhere and setting it up quickly is possible. It features a solid and lightweight aluminum frame, too. However, the included setup instructions are quite vague and difficult to understand. Still, most users agree that it provides a great value overall. I also highly advise using this flexible mono-crystalline solar panel from Renogy. 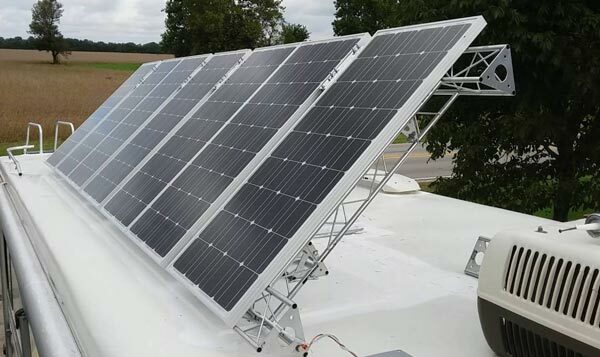 It has a max of 248-degree flex range, which makes it capable of handling various applications, especially in those instances when the standard solar panels are not that convenient to mount, like when installing it on an airstream’s curved roof. Aside from its good flex range, I am also pleased with the solar panel’s high light transmittance as well as its long service life. I can also guarantee most users of its excellent performance every day because it has self-cleaning and anti-fouling abilities. I am also satisfied with the lightness of this solar panel. It is lightweight and thin, which promotes ease when it comes to installing it on curved surfaces. You can also use it in supplying power to a wide range of applications and onboard electronics. I am also impressed with the advanced polymer materials used in the panels as such also improve its lightness. It also works well if you plan on doing a stealthy setup for your solar system. It is because it is thinner in comparison to rigid systems. Furthermore, this solar panel is solid and strong enough as such makes it capable of withstanding snow loads and extreme winds. The edges of the solar panels are a bit sharp, though, so it is advisable to wear gloves when handling them. With its more than 20 percent efficiency, I am pretty sure that this 100-watt solar panel from ALLPOWERS can offer a high level of satisfaction to those who plan to use a solar system for their recreational vehicles. It provides more efficiency and power even if it is just as large as traditional models. One impressive fact about this model is its durability. I find it durable and strong because the solar panel is constructed out of water-resistant and semi-flexible materials. In addition, it also features a waterproof and sealed junction box. With that, I am pretty sure that this panel is long-lasting. The solar panel is also capable of supplying the specific amount of power needed by most potential users of solar systems. That is possible even with the lightweight construction of the unit. It is lightweight enough that transporting, hanging, and removing it is easy. I also find it easy to install because it does not only have a unique and frameless design but also metal-reinforced mounting holes. Another major benefit of the unit is its bendability. You can curve and mount it on a boat, tent, car, trailer, truck, RV, or any other uneven and irregular surfaces with ease. One flaw, though, comes on the wire assembly that you can find on top. It is because the wires appear in opposite directions, so routing them might be a bit challenging. 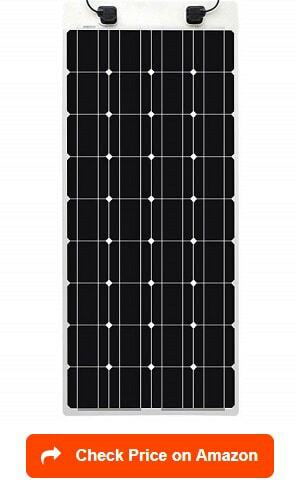 I am also glad to include the Newpowa 2-piece 100-watt polycrystalline solar panel in this review. It is primarily because I found out that it is one of the excellent performances in the solar panel industry. It makes use of high-performance cells encapsulated in EVA. One thing that impressed me about this solar panel is that it has an exceptional durability. I think it is due to the fact that the solar panels make use of heavy-duty anodized aluminum for their frame. With that, it is possible for you to enjoy exceptional rigidity. The solar panels also come in full-size, which means that they can really handle even heavy applications and uses. The solar panel installation process is also quick and easy. It does not involve complicated steps. It works efficiently if you want to keep the battery of your RV charged for quite a long time. Another thing I am pleased with is the solid and sturdy frame of the solar panel. You can also easily hook it up and use. It also features a rugged and sturdy design that can withstand snow load, hail, and high wind pressure. As for the flaw, I noticed that its junction box appears to be of subpar quality. Lastly, I want to recommend the Go Power! GP-PSK-120 solar power kit. This specific kit provides an easy and quick solution if you want to charge your batteries using solar power or the sun. I think that it is a great option since I figured out that most of its users give it a stamp of approval because of its good performance. It supplies around 120 watts of power. The kit is beneficial because it holds most of the things that you need in setting it up and charging your battery up to a hundred percent. I am also pleased to say that the kit is already equipped with a solar controller, which you can use in keeping track of the system. It also has cables that also have battery clamps that you can use to connect to your batteries with ease. One more impressive thing about this unit is its portability as it means managing it will be easy. You can quickly and easily set it up within just a few minutes, thereby promoting ease in charging your batteries. It has its own carrying case, too, which is a good thing if you plan to bring it to other places. However, despite its excellent performance, it is also one of the priciest options, which is a drawback. Efficiency – Despite all the amenities and facilities that you can have onboard your RV, remember that its space is still less spacious if you compare it to your home. With that in mind, you need a highly efficient solar panel – one that makes use of only a little space while still maximizing its output. Also, remember that the efficiency in solar panels for camping trailer and RVs can be defined as the specific amount of solar energy converted to electricity. Such amount is usually reflected in the form of a percentage. When searching for the best solar panels for RV use, make sure that the electrical output is sufficient enough for the onboard electronics in your RV. You will instantly know that the solar panel is highly efficient if your RV will receive enough voltage. When identifying the efficiency of a solar panel kit, check its type. Note that solar panels come in three different types with each one having varying efficiency based on its make. One type is the amorphous solar panel. It is the most inexpensive type but take note that it is also the poorest in terms of efficiency. You can also pick the polycrystalline type with an efficiency rating measured at around 16 percent. This specific type produces two times the current created by the amorphous type. The third type is the mono-crystalline, which has an efficiency rating of more than 16 percent. Such efficiency is a bit higher than polycrystalline. Wattage cells – Your chosen solar panel’s wattage can be defined as the current that the solar panels are capable of outputting. You can determine such wattage based on the current that every cell within the panel can output. It is actually beneficial to have an RV solar panel with a higher wattage as it also means that it can produce current capable of supporting numerous electrical activities. A higher wattage can also guarantee a higher efficiency rating each time you connect your electronics and appliances to the source of current. However, prior to choosing to buy high-watt solar panels, make sure that this is the voltage that you need exactly. It is mainly because these solar panels are often expensive. It would be best to choose a small solar panel at first. You can just upgrade into a 2-panel set later on. Portability – Another contributing factor in your final decision is the portability of the unit. 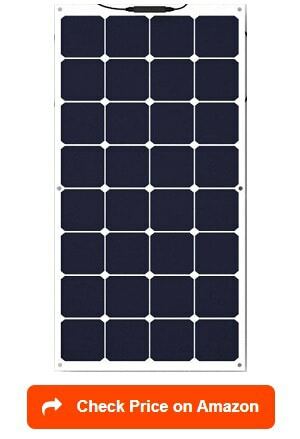 Remember that it is crucial to invest in the most portable solar panels for RV. It is mainly because you will need to carry it to your RV from time to time. 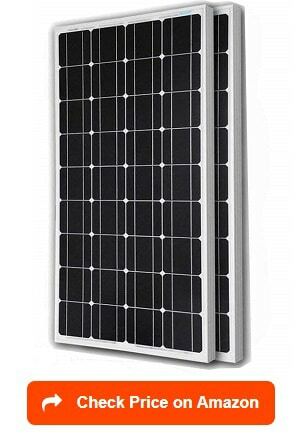 It is also advisable to pick portable RV solar panel kits as these promote ease of installation. If unfortunately, you have chosen a solar panel kit, which is a bit big, then a wise tip is to opt for one that is already equipped with cables as such promotes ease of movement. Reliability especially when you are on the road – One of the major advantages of installing an RV solar panel is that it is capable of offering a more reliable and convenient source of electricity once you start driving on the road. Some of the systems offered today are, fortunately, inexpensive. They are also capable of providing more than enough power designed to recharge the battery of your RV. You can also find more robust systems capable of providing a more reliable source of power for radios, lights, televisions, and appliances. Once you are prepared to invest in a solar panel, take into consideration its reliability and efficiency. You should then consider starting with a small set with two panels. Avoid making the mistakes committed by RV owners who tend to overestimate their needs by investing in a larger solar system. It would be best to start small at first. Note that if you start small then you always have the option of expanding once you figure out your specific energy requirements later on. Geographical location – Another thing to keep in mind is that your present geographical location has a say on the specific type of solar panel kit you specifically need. In case you encounter sunlight problems because of your current location, ensure that you choose a highly efficient solar panel kit. A highly efficient solar panel is a major help in dealing with sunlight issues. Durability – While it is true that solar panels are prone to aging and wearing out, make sure to buy one, which is highly durable so it will last for a long time. Avoid going for cheap and low-quality ones as these might only serve you for the short term. They tend to wear out too soon, causing you to buy a new one frequently. This is not actually helpful if you are planning to save money. 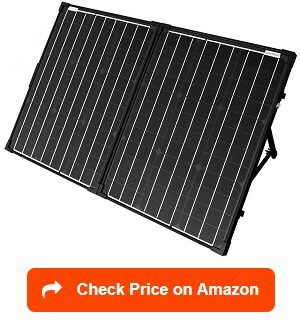 What is an RV Solar Panel? An RV solar panel refers to a device, which works effectively in converting sunlight into electricity/power. It is a great investment for any RV owner as it provides solar power wherever you are. While it is a bit time-consuming to install, especially if you choose to do it using the DIY route, it is still beneficial considering the fact that it provides free energy and power. If you love to camp out or go off the grid, then ensuring that you have a solar panel around can help you a lot. It lessens your energy consumption without requiring too much on your part. All that’s needed to make it work is the open run and some sunlight. It lets you run all your onboard electrical appliances without requiring anything except the sun’s rays. With that, you can relax since you no longer have to operate a generator, which might only produce a lot of noise. It is even the best solution for serious RV enthusiasts and boondockers. Aside from being quieter, it is also safe for the environment. It is costly to set it up first, though, but eventually, you will realize that it is a more cost-effective choice than having to fill up your liquid propane tank all the time. To get to know more about how solar panels for recreational vehicles work, its different types, and what benefits you can gain from them, I advise you to continue reading the remaining sections of this article. An RV solar panel works by providing solar power. Actually, there is a need for you to invest in a few solar panels so you can efficiently run the appliances in your motorhome via solar energy/power. The first thing that you have to do is to mount the solar panels on the roof of your RV or along the rig when you park it. The number of solar panels you specifically need will be fully dependent on the amount of power you need. Once installed, the solar panels will start to function by converting the energy of the sun to power. The generated power will then be transmitted to the wires that connect all the solar panels together. This will then be taken down to your vehicle. However, prior to providing your RV with solar power, the whole process has to make some stops. The first one is the solar charge controller, which refers to the device that transmits the power generated and created by the panels to the battery system of your RV. With the help of this device, it is possible to regulate the power received by your RV’s batteries, thereby preventing them from getting overcharged. It can preserve the longevity and functionality of your batteries, making it a vital device. It is because overcharging your batteries might only cause irreparable harm to them. Once the generated power gets transmitted to the controller or battery charger, you can expect it to be ready for use. One last thing that you have to remember, though, is that the power that is already stored in the battery bank is still the DC version. This is the type of power, which runs cigarette adapter-style plugs, such as the phone charger in your vehicle. You can’t expect to use the stored power/energy unless every device in your recreational vehicle uses such type of plug. Fortunately, it is now possible for you to invest in an inverter. With this inverter, it would be easy for you to transform the stored energy or power to AC. Once the power passes this stage, you can expect the generated energy to run into your breaker box then to the outlets in your RV. Polycrystalline – Containing a few small solar crystals, the polycrystalline solar panel is often taken from several blocks of silicon. 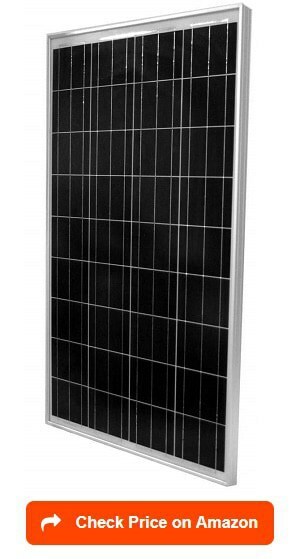 This type of solar panel is commonly used in many recreational vehicles. While the power it produces is less than one percent of what monocrystalline solar panels produce, it is still a great investment because this power loss is easy to neglect. Monocrystalline – This type is constructed from one large silicon crystal. Many consider this type as the most effective solar panel considering the fact that it yields a high charge output. It is also capable of producing and supplying a higher amount of power when used in low light conditions. Amorphous – Also called thin-film panels, this type is created by spreading silicon on a large bed. What is good about these solar panels is that they are not that costly to make. However, they also produce the lowest output of power out of the three. Also, while this solar panel functions well, it still needs up to three times more roof space than monocrystalline and polycrystalline when providing the same amount of power. Effective in charging your house batteries – One advantage of the solar power provided by your solar panels is that it supplies a steady and slow charge to your RV batteries. It is beneficial because it is the natural way of charging batteries. With that, it is possible for you to maximize and prolong battery life. Provides electrical power – It ensures that you have a constant supply of electrical power. This is possible no matter how remote your present location is. This also lets you lessen your worries when exploring breathtaking views while in a new location. It also gives you a backup power in case of an emergency. Clean and quiet – Another thing that you can enjoy from RV solar panels is its clean and quiet operation. This makes this source of solar power easy to use and manage. Note that solar panels do not consume any fuel. They do not emit waste, too. With that, you have an assurance that the panels are clean, making them safe for the environment. Furthermore, an RV solar panel does not come with any moving parts. This is the main reason why it does not produce a mechanical noise. With that, you know that it can give you the power you need without causing you to deal with too much noise. It is also easy to use as you just need to place it under the sun to generate power. Maximizes the life of your RV’s batteries – It is mainly because of the ability of the solar panels to generate pure DC electricity each time you expose them to sunlight. This is what your RV batteries actually want. These electrons can saturate the batteries slowly and steadily every day. With that, you can minimize the risk of the batteries from experiencing deep discharges repetitively. Note that such discharges can negatively affect the life of the batteries, especially if they are the lead-acid type. With the help of a well-designed and fully functional solar battery charging system, you can increase the life of lead-acid batteries by up to two times. Promotes electrical independence – An RV solar panel guarantees electrical independence provided you get a system, which comes at a proper size and features appropriate parts. With such a system, you can park wherever you wish without worrying about where you can find shore power. There is no need to run a generator, too. Requires the least amount of maintenance – Remember that solar panels do not require the use of fuel. They do not have moving components, too, so there is a lower risk for them to wear out soon. You do not also need to change fuel, oil, or air filters in the solar panels. The only maintenance that you need to do is to clean up the panels’ surface. Highly reliable and safe – In most cases, RVs run at lower than 30 amps and at exactly 12 volts. This results to a lower risk of experiencing electrical fires or getting electrocuted. Solar panels installed with the right fuses and wire sizes can also be expected to make your electronics safe and reliable. Cost-effective – You will also love the fact that solar panels are cost-effective. While you may need to spend some money during the initial setup, you will still get great returns, in the long run, considering the fact that you will be able to get power directly from the sun. Promotes freedom – It is primarily because it lets you freely enjoy the natural settings outdoors as well as the breathtaking views on the road. The freedom can be taken from the fact that you are free of any worries as far as power and electricity are concerned. Produces the least amount of noise – One possible reason why you love to camp out on your RV is to get in touch with nature. You may want to take yourself away from too much noise. In this case, you may not want to use a generator, which produces disturbing and annoying noises. You do not want your source of power to be a nuisance while you are on the road just because it is noisy. In addition, a noisy power source, like a generator, can quickly leave an unwanted impression on the people around you. Fortunately, you can now install solar panels that are totally silent. You can operate them without worrying about the noise because they work quietly. Guarantees fewer emissions – If you are concerned about the environment then you will love the fact that the best RV solar panel is good for the environment. It is mainly because it generates less emission. While you can also use generators that follow strict emission guidelines, you can still choose to install RV solar panels as they are guaranteed to be not bad on the environment. Also, solar panels do not carry the risk of causing carbon monoxide poisoning, which is a common issue when using generators. While such poisoning does not take place all the time, it still happens. True, the generators come with carbon monoxide detectors. However, you can’t fully rely on them as they also tend to malfunction. With that in mind, installing RV solar panels can help you a lot. You will also love the fact that the solar panels are easy to use. Once installed and there is enough sunlight, you can expect the panels to work like magic by letting you generate free power and electricity. Managing the solar panels is easy, too. Just make sure that you also take good care of the solar panels, so you will be able to enjoy using them for quite a long time. What is so favorable about using RV solar panels is that they require only a little maintenance. Provided the solar panels are well-designed, you have a hundred percent assurance that you will not deal with a lot of trouble maintaining them. It is mainly because the solar panels do not come with moving parts that tend to wear out too soon. Also, they do not consume fuel. Solar panels do not also have filters that might have to replace often. All it takes to maintain their excellent condition is to use a non-abrasive cleaner to clean them occasionally. Ensure that the fasteners and mounts are tight, too. Note that certain factors, like expansion, vibration, and contraction brought on by the changes in temperature might cause the mounting hardware to loosen. If you are using flooded batteries then one maintenance tip is to check their water level monthly or quarterly. Add just the right amount of distilled, pure water if necessary. Make it a point to monitor the wire connections, as well. Clean them right away in case you detect any corrosion. What are the different types of RV solar panels? Solar panels actually come in three common types. There is the mono-crystalline solar panel, which is constructed from one large silicone crystal. It is considered to be the most efficient while having the ability to yield a higher charge output. It is also capable of producing a higher amount of power in low-light conditions. Another type is polycrystalline, which comes from silicon blocks containing a few small solar crystals. It produces approximately one percent less power when compared to mono-crystalline solar panels. Polycrystalline is also one of the most commonly used types of solar panels today. Also called the thin film, amorphous is the third type of solar panel that you can pick. It makes use of silicon, which creates a panel by spreading it on a large bed. It is the most inexpensive type. However, it also yields the least power output among the three types. While it functions well, note that it also needs about three times the roof space used by mono-crystalline and polycrystalline for just a similar power yield. How do RV solar panels work? RV solar panels work by converting sunlight into electricity or power. The panels create an electric current each time the sun hits them. The produced electric current is then fed into a charge controller. This is the one that will control the amount of current that gets into the battery. After that, the batteries will create DC power. There is also an inverter, which converts the DC power into AC, which is the specific type of power you need to operate items, such as laptops, phone charges, and blenders. What are the benefits of an RV solar panel? One of the major benefits of installing a solar panel in your recreational vehicle is that it is easy to use, quiet, and easy. It does not consume fuel nor give off waste. The fact that there are zero moving parts also means that it does not produce any mechanical noise. Solar panels also work in maximizing the life of your battery. It is mainly because solar panels are capable of generating pure DC power each time you expose them to the sun. That’s what your batteries specifically prefer. With the solar panels around, you also have the chance of parking wherever you want. You can gain electrical independence since you know that you will receive power anywhere. Aside from that, they are beneficial as they are safe and reliable to use while requiring the least amount of maintenance. What are the types and purpose of a charge controller? If you are planning to install a solar panel into your recreational vehicle then take note that you have three options. The first type is the simple 1- or 2-stage controller. It comes with shunt transistors designed to regulate the voltage in just one to two steps. The main purpose of this controller is to short the panel when a specific voltage is reached. The second type is the pulse width modulated (PWM) controller. This charge controller is known as the traditional form, which is also considered as the industry standard at present. Lastly, there is the MPPT or the maximum power point tracking. This controller works by identifying the ideal voltage and amp of a solar panel exhibit. This results in an additional power, around ten to thirty percent more of the sun-oriented cluster. With the help of any of these charge controllers, you will have full control over the voltage of your device. It also opens the circuit and halts the charge just in case the voltage of the battery gets higher than a specific level. The answer to this is actually dependent on the specific amount of power consumed by your air conditioning unit. In most cases, though, RV owners need around three to four solar panels. Such number is enough to give enough solar power for RV air conditioner. One way to compute the specific power requirements of your RV is to boondock without using an AC generator. You will find that useful in determining the length of time it takes to make your vehicle run with normal usage and without the use of any generators, only batteries. In case your batteries consumed up to 3 days to drain, then take note that such batteries are capable of supplying approximately 200 amp-hours of energy, which you can derive. One issue with this is that you are only allowed to utilize approximately 75 percent of such energy. With that in mind, only around 150 amp hours are what you can use. Divide such figure by the length of time spent for your batteries to drain during the time when you boondock. That means you have to divide 150 amp-hours by 3 days. The result is 50 amp-hours, which specifically determines the specific energy consumed regularly. It should be noted that a 100-watt solar panel can produce approximately 6 amps per hour of having the sun at its peak. You can translate this to around 30 amp-hours every day. That said, there is a chance that you will require two 100-watt solar panels to either recharge or supply full power to your vehicle every day. How to size my RV solar panel system? Sizing an RV solar panel system is actually doable if you are fully aware of how it is done. The first step actually involves identifying the appliances that use AC and DC power as well as the specific number of hours each one operates or runs daily. The next thing to do is to compute the total amps every week. The figures that you use should be the total amp hours daily that you need to multiply by the specific number of days every week. After that, you should consider matching the total amps every week with the ideal solar power solution. Do I require additional hardware? Yes, there are certain items and hardware that you will need to use when it comes to installing RV solar panels. Fortunately, most of these items and hardware already form part of the best RV solar kit. Some of the hardware and items you might need for the installation are T-knobs, mount adapters, rocker mount sets, mounting L-feet, sealant, tape, and tilt bar sets. What are good RV solar panel brands? With the best RV solar panels and kits you will find it easier to charge the battery bank of your vehicle with the aid of free and abundant power source. The best solar panels for RV battery are actually beneficial for you, especially if you are into a kind of camping, which involves dry camping and boondocking. The best RV solar system kits can also help ensure that you will never run out of power while you are on the road. This can give you peace of mind and make you feel the comforts and conveniences that your home provides even if you are away from it. We would like to thank you for reading this article. Find out more about how to choose the best RV surge protectors and best RV generators with our reviews and ratings. Furthermore, please take a look at the best RV converters, best RV inverters and best RV batteries to buy the right one for your RV power and electrical supplies. Learn basic electricity. (Ohms Law, Volts, Amps, Amp-hours, and how to calculate Voltage Drop). Read about battery charging, and how with lead acid batteries ( most ) it slows down A LOT after about 85 percent of full charge. Find out first, before buying panels, why most people who buy these systems for their RV keep adding more panels after installation but generally to no avail. Buy a battery monitor that will measure amp-hours of iuse BEFORE you buy solar panels. Figure out FIRST exactly what you need to do to mount the panels on your roof. Will you need to drill holes in a fibreglass roof, or will you use an existing roof penetration. This can cost as much as the panel depending on how many panels. Measure the dimensions of any panel you are considering and figure out where it will fit on your roof without any shadows. Cheaper, higher wattage panels are going to be BIG. Make sure they can fit.